MANY CHRISTIANS THINK THEY CANNOT ADEQUATELY SHARE THE gospel unless they’ve had formal training in evangelism. I’m for evangelism training, but training is not necessary before you can tell someone about Jesus and give your own testimony about how you came to know Him. In John 9 we read of a man born blind who, within an hour after his conversion, is witnessing to Ph.D.s in religion (the Pharisees). Obviously, he’d had no evangelism training, but he was able to talk about Jesus and his own conversion. As Martyn Lloyd-Jones used to say, after being saved and after hearing countless presentations of the gospel in sermons, if Christians still believe they cannot evangelize without massive amounts of training, then either they’ve heard very poor preaching or they’ve been very poor listeners. However, it does boost one’s confidence in sharing the gospel to know a general outline of what to say and to have some appropriate verses of Scripture committed to memory. Several years ago I developed an outline to hang my thoughts on, along with at least two key verses for each section. I don’t follow it woodenly in every situation, for each evangelistic encounter is unique. And sometimes I condense it a bit. But having a full presentation of the gospel ready on my lips does give me a sense of direction and a feeling of preparedness. You’re welcome to adapt the outline for use in your own personal evangelism. 1. There is one God, He is the Creator, He is holy, and He is worth knowing. See Deuteronomy 4:39; Isaiah 46:9; Genesis 1: 1; 1 Peter 1: 16. Such a God is worthy of our pursuit! 2. Everyone is a sinner separated from God. See Romans 3:23; Isaiah 59:2. We have no idea how unholy we are in comparison to God. 3. There is a penalty for sin. See Romans 6:23; Hebrews 9:27; Romans 14:10; Matthew 25:46. The penalty is judgment and Hell. 4. Jesus paid that penalty for all who believe. See Romans 5:8; I Peter 3:18. Jesus took God’s judgment so believers could have mercy. 5. No one can earn God’s forgiveness and favor. See Ephesians 2:8-9; Titus 3:5. We’re not saved by our works, but by faith in Jesus’ work. 6. We should respond with repentance and faith. See Mark 1:15; John 3:16. We should turn from sin and turn to Jesus for forgiveness. 7. We can have assurance of eternal life with God. See 1 John 5:13. Jesus’ resurrection and God’s Word assure believers of forgiveness. A. It is not only right for you to live for the God who created you and owns you, but you will find your greatest fulfillment only when you fulfill the purpose for which you were made, and that is to know God and live for Him. B. Do you believe this great message of the Bible? Genuine belief in its truth is demonstrated by turning from living for yourself and believing that because of His death and resurrection Jesus Christ can make you right with God. C. Are you willing to express repentance and faith in prayer to God right now? *SOURCE: Donald S. Whitney. 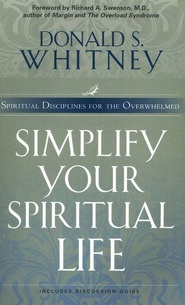 Simplify Your Spiritual Life: Disciplines for the Overwhelmed. Colorado Springs: NavPress, 2003. 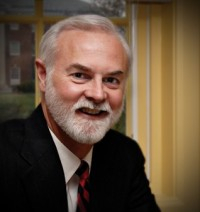 Since 2005, Don Whitney has been Associate Professor of Biblical Spirituality at The Southern Baptist Theological Seminary in Louisville, Kentucky, where he also serves as Senior Associate Dean. Before that, he held a similar position (the first such position in the six Southern Baptist seminaries) at Midwestern Baptist Theological Seminary in Kansas City, Missouri, for ten years. He is the founder and president of The Center for Biblical Spirituality. After graduating from Arkansas State University, Don planned to finish law school and pursue a career in sportscasting. While at the University of Arkansas School of Law, he sensed God’s call to preach the Gospel of Jesus Christ. He then enrolled at Southwestern Baptist Theological Seminary in Fort Worth, Texas, graduating with a Master of Divinity degree in 1979. In 1987, Don completed a Doctor of Ministry degree at Trinity Evangelical Divinity School in Deerfield, Illinois. Currently, he is completing his Doctor of Theology with Specialization in Christian Spirituality at the University of South Africa. Prior to his ministry as a seminary professor, Don was pastor of Glenfield Baptist Church in Glen Ellyn, Illinois (a suburb of Chicago), for almost fifteen years. Altogether, he has served local churches in pastoral ministry for twenty-four years. His books include: Spiritual Disciplines for the Christian Life; Ten Questions to Diagnose Your Spiritual Health; How Can I Be Sure I’m a Christian? ; and Spiritual Disciplines within the Church. Tags: AN OUTLINE TO HAVE IN MIND WHEN SHARING THE GOSPEL, Donald S. Whitney, Evangelism Training, Outline of the Gospel, Personal Evangelism, The Gospel and personal evangelism, The Gospel Outlined, What are the steps of the Gospel?